Slate and VoteCastr are teaming up to publish real-time projections on Election Day. This Nov. 8, Slate will publish real-time projections based on voter turnout, so citizens will finally know as much as the campaigns do about who is winning and why. 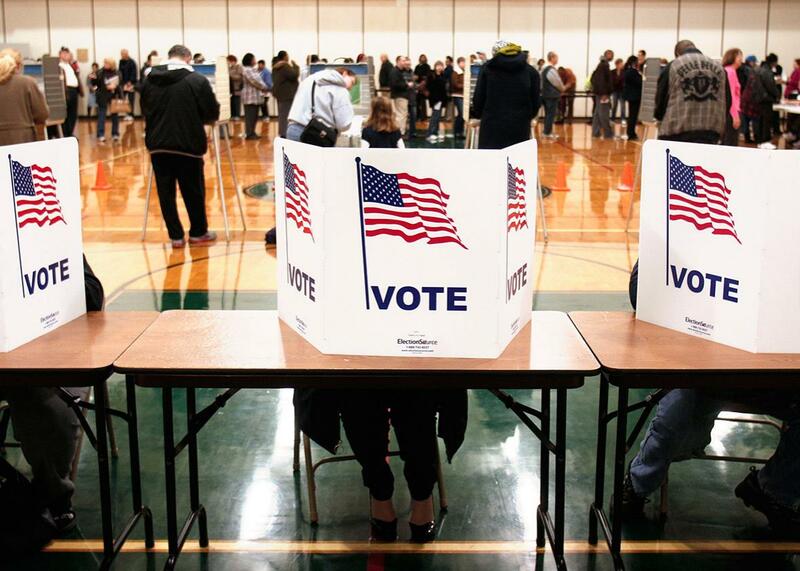 People vote on Nov. 6, 2012, in Sterling Heights, Michigan. Read Slate Editor Julia Turner on why Slate is breaking the traditional Election Day information embargo. Everything about election-night journalism has gotten flashier over the generation since—except the scoops. The networks’ early calls prompted a congressional inquiry into whether they had depressed West Coast turnout. The three broadcast networks rejected demands that they wait until everyone in the country had voted to report or forecast any results. (There was scant evidence that NBC’s early call had exerted any influence on voter behavior or outcomes.) As a concession, however, the networks promised not to use their exit polls to project the race in a given state until polls had closed there. In the years that followed, other news organizations that had not been subject to the same political pressure—radio stations, newspapers, wire services, cable networks, and websites—nonetheless accepted it as a controlling precedent. Now a de-facto self-imposed gag order hangs over the daylight hours of the year’s biggest news event, sequestering the civic exercise of Election Day from the media spectacle of election night. This distinction is enforced only by the pieties of good-government advocates who, in the wake of the 1980 episode, paternalistically argued that voters cannot be trusted with live information. Now newsrooms show long lines, interview people with “I voted” stickers, speculate about the impact of the weather—but refuse to tell the public who is winning and who is losing. Once the polls close, there is intense competition for their decision desks to call states, but up until that point news organizations enforce what amounts to a cartel of silence. To pick up Newsweek’s metaphor, on the biggest news day of the year, news organizations offer an interminable pregame show and then flip to the final score, skipping the Super Bowl itself. Campaigns, however, do know who is winning the game as it is being played. They have never relied on exit polls, which were designed to illuminate who voted and why, for the benefit of postelection analysis, not to predict results in real time. Instead, candidates, parties, and super PACs use a combination of analytics and active tracking of turnout across preselected precincts to produce rolling projections of how many votes they have won as the ballots are cast. They have found this method to be uncannily accurate at matching the ultimate vote count. Voters have never had access to such analytics, but there is no reason that journalists can’t apply the same methods as the campaigns—and there are very good reasons why doing so is in the public interest. A group of election veterans has therefore come together to form a new company called VoteCastr, in which I am a partner, and we are building our own version of that Election Day data apparatus. In partnership with Slate, VoteCastr will publicly debut its system on Nov. 8. From the moment that polls open on the East Coast, Slate readers will know as much about how many votes Hillary Clinton and Donald Trump have accumulated across the battleground states as Hillary and Donald and their teams do. Our goal is not to beat the networks and wire services to declaring winners and losers—election night will still belong to their analysts and their magic walls—but to guarantee that citizens who have been entrusted with a vote also have access to as much information as possible about how their fellow citizens are voting. Just after Labor Day in 2008, a team within Barack Obama’s Chicago headquarters began laying the groundwork for what on Election Day would become the “national boiler room.” The campaign planned to dispatch poll-watchers to more than 50,000 precincts across 17 battleground states. At three-hour increments throughout the voting day, the watchers would call a dedicated phone number and punch in the total number of voters who had cast ballots at the precinct they were observing. The campaign’s data team had been running large-scale surveys throughout the year, so it already had a clear idea of just how much support it could expect in key areas. By combining its survey data with the real-time turnout reports from the field on Election Day, analysts could assess how Obama-friendly precincts were performing relative to McCain-friendly ones and make more than an educated guess about which states the campaign would carry. As political analytics have grown more sophisticated in the years since, the speed and quality of Election Day projections have only increased. In states with extensive early voting programs, it is now possible to know which citizens have returned ballots—local authorities typically release a list of voter names each day during an early voting period—and match those to statistical models predicting how each individual will vote. Even before the polls opened in Ohio on Election Day 2012, Obama’s analytics staff predicted that the president was getting 56.4 percent of the early vote in Hamilton County, which contains Cincinnati. The guess was just two-tenths of a percent away from the actual tally released by county officials as soon as polls closed. Strasma and Hazelwood will be conducting large-sample surveys—many more respondents than typical media polls, each answering far fewer questions—that will allow them to assess support for presidential and statewide candidates at the level of individual precincts. At the same time, VoteCastr is training an army of hundreds of turnout trackers, each assigned to preselected polling places across battleground states. (The specific states will be determined closer to Election Day, depending on public interest and competitiveness, for both the presidency and Senate control.) The survey data will predict how exactly support in, say, Cleveland’s precinct 14D should break down between Clinton and Trump, and between Sen. Rob Portman and his challenger, Ted Strickland. So when a tracker visits Denison Elementary School and reports via a smartphone app that 78 people have voted by 11:15 am, VoteCastr can determine how well each candidate is faring. By blending this information with reports from dozens of other precincts across the state, VoteCastr’s statistical models can predict who is, at that very moment, winning Ohio and by what margin. Over the course of the day, each candidate’s vote share will move, as turnout surges in some areas and wanes in others. All of this information will be presented to Slate readers in real time as the day unfolds and new data comes in. In those states where a large share of the electorate votes early—like Florida, North Carolina, Colorado, and Nevada—we will know which candidate is ahead before dawn has even broken and whether that lead appears insurmountable. The accuracy of these projections will be reliant on the underlying polling and susceptible to some of the same vulnerabilities as other efforts to measure public opinion through surveys. If voters are systematically underreporting their support for one candidate, or if there is an abnormally late swing toward a candidate, VoteCastr’s models will probably fail to accurately forecast support levels. But by late October the debate we are likeliest to be having about the accuracy of polls is how much the poll sample looks like the group of people who will end up actually voting. The benefit of the VoteCastr method is that it is continually correcting its sample by feeding in new information about who has already voted, as opposed to relying on guesses based on people who say they will (or who pollsters have decided are most likely to do so). In the end, the results of this election will all come down to turnout, and ours is the only way to track turnout in real time. In 2008, Obama’s national boiler room circulated regular turnout reports to senior staff at headquarters, but there is only so much campaigns can do on Election Day itself. Their television buys and direct-mail programs are complete, and they can’t realistically move staff or redirect the candidate’s plane to another part of the country to boost turnout. Ultimately what is left to do is to tinker most efficiently at the margins: to redirect get-out-the-vote phone calls or digital contact (like text messages) toward underperforming areas or to prioritize the candidate’s satellite or radio interviews into markets that need a boost. Some campaigns will physically redeploy surrogates and canvassers, but usually only within states, not across them. (A more ambitious form of turnout reporting, in which campaigns track which individual voters have cast ballots, has led to colossal technical failures—both when the Obama campaign code-named its program Houdini in 2008 and when Mitt Romney’s staff called his ORCA four years later.) Campaign managers don’t build such boiler rooms because they think what they can do on Election Day will necessarily tip the election, but because they want as much information as they can possibly get in order to avoid surprises when the polls close and prepare to explain the outcome. Why shouldn’t voters have access to the same information used to profile and sort them, information that can help make sense of the way that candidates market to them through the election’s final hours? At least since the 1970s, journalists have worked to generate reasonable simulacra of the tools campaigns themselves use internally to inform strategy and guide tactics. Media surveys, especially tracking polls, enable the press to monitor horse-race movement the way a political strategist would. Simulations like those popularized by Nate Silver help the public weigh a range of potential electoral college outcomes the way national campaigns do when deciding how to shift resources around the map. Televised focus groups allow viewers to feel the texture of voter sentiment. In this election cycle, several broadcast networks and national newspapers have wisely signed contracts with political data vendors providing access to the voter files that campaigners use to triage the electorate. These investments by media organizations serve to shrink the distance between public and private information. This is not purely to indulge the fetish with campaign mechanics that Joan Didion dismissed as “insider baseball” or to pursue transparency for its own sake. There is at stake a crucial democratic principle: Only by trying to replicate the lens through which politicians view the electorate can citizens begin to recognize how their leaders see them. The stories that candidates tell themselves about the result of an election often begin while the polls are still open and endure throughout their time in office: A candidate who is sworn in thinking he won by turning out a party base is likely to govern differently than one who credits a last-minute swing from late-deciding independents. By midafternoon on Nov. 7, 2000, Karl Rove had already internalized the notion that if George W. Bush were to win the presidency, he would have done so despite failing to mobilize large numbers of social conservatives. That analysis hung over the White House for all of Bush’s first term, but the media did not fully process it as a guiding principle of his presidency for nearly a year—in part because they were unable to see each side’s base vote come in at the same pace that Bush’s team did. Journalists know that people who work in politics have access to proprietary information that can give form to our vague speculation about how a strong ground game or voting-machine problems or weather patterns are affecting turnout in different places. And yet no news organization has brought the ideal of letting voters know what the campaigns know to its coverage of Election Day itself. Instead, we spend all day calling (and now texting and direct-messaging) our sources inside the campaigns to ask what they are seeing and hearing—and usually end up with little more than self-serving summaries that have rattled down the consultant grapevine. This information occasionally informs coverage, although in ways so coded or cherry-picked that readers and viewers would probably be better served to receive none of it at all. With nearly one-third of Americans now voting early—potentially filling out a ballot at a dining room table with CNN on in the background and an open tablet displaying FiveThirtyEight—the Election Day distinction is also pathetically out of date. For those who do still vote on that day, the news void is predicated on a condescending fiction. Do we really believe that after months of being perpetually subjected to assessments of the horse race—polls, averages of polls, forecasts synthesizing the poll averages—the slate can be wiped clean and voters restored to a state of decision-making innocence in some kind of hushed democratic idyll? But little beyond superstition supports the claim that exposing those who haven’t yet voted to information about the state of the race will discourage them from exercising their franchise. Research in the wake of the 1980 election—and another similar episode, in 1964, when CBS declared Lyndon Johnson the winner at 6:03 p.m. Pacific time—yielded unconvincing evidence that the early calls had had an impact on Western turnout. (It was hard to disentangle the fact that Carter, likely informed by his own private data, did not wait until polls had closed to concede.) In fact, recent experiments have shown some of the most effective techniques to mobilize nonvoters involve increasing awareness of the rate at which their peers and neighbors are voting. It seems as reasonable to hypothesize that reports of turnout levels and public attention to the shared experience of the ballot box would be more likely to motivate citizens to participate than to discourage them. Today, the obligation on an independent press is no longer to challenge the information monopoly of television networks and wire services, which now share exit poll data under newly effective quarantine, but to produce for the public good the same type of private information that political insiders have long taken for granted and will use until the last available moment to try to win your vote. The time has come to level the playing field and to trust that the democratic process is always better when citizens are informed, not cosseted, by the free press—especially on the day it matters most.